Issues may arise during construction that bring building to a halt, leaving timber frames and other parts of a building exposed to the weather for a time. Bad weather can also lead to flooding of properties. In such events there are no simple rules to assess the impact of moisture on timber-framed construction. Each individual case will need to be assessed to determine the extent of any degradation, and the rectification or repair required. This guide offers an overview of the key issues for assessment of moisture exposure and possible rectification. 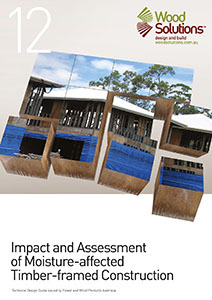 It has been written to help the building industry and owners to understand the key issues when assessing moisture-affected timber construction. It also provides some guidance on how to address these considerations.